How a single discovery and determination of Howard Carter made an unknown boy king to become a symbol of Egyptology all over the world. Egypt is known for its riches especially in treasures and gold. However, many of this treasures were buried with their pharaoh kings, which of course, takes the intervention of some curious fellows to be accessed. From Alexander through Hadrian, the old tales and mysteries of Egypt have held some specific figures in awe and excitement with several interesting and intriguing discoveries made day by day. However, many of these discoveries were made by Napoleon, who wishes to follow the steps of heroes before him. He, therefore, brought about the period of the Egyptology science. Napoleon with his about 17,000 armies sailed with the machinery of war and took along with him engineers, archaeologists, scholars, scientists to plan, map out and to also look into the mysteries to be uncovered. In their adventure, they discover several tombs in the Valley of the Kings, this is because several Egypt kings (pharaoh) has this land chosen as their final place of rest. They discover several wonders in these Egyptian pharaohs tomb that made them more anxious about what the Valley of the Kings possesses. Not one of them did not have a thirst for these ancient Egyptian wonders, even the general, who is young and ambitious, found himself thirsty to see more of what the Egypt tomb consist. Years later, several other tombs were discovered by explorers all over the world, however, the tomb of the boy king Tutankhamun was hidden, still. This tomb housed a boy king who reigned for not up to ten years in Egypt. Howard Carter, whose determination helped to give this boy king popularity, was not likely to make this discovery of ancient treasure that many others did not find. He did not have any formal education. His knowledge of the Egyptian histories was based on his artistic skills, being the son of an artist too. Howard Carter got his first job at age 17 to write scenes from the tomb walls. He went with excavator Flinders Petrie and Petrie gave tips about the mysterious young king called Tutankhamun. Howard Carter did not know who the king Tut was but he felt hair strands standing. The rumor about his tomb hidden somewhere, untouched and filled with treasures aroused his interest as well. This, therefore, marked the beginning of his search for the tomb of Tutankhamun. 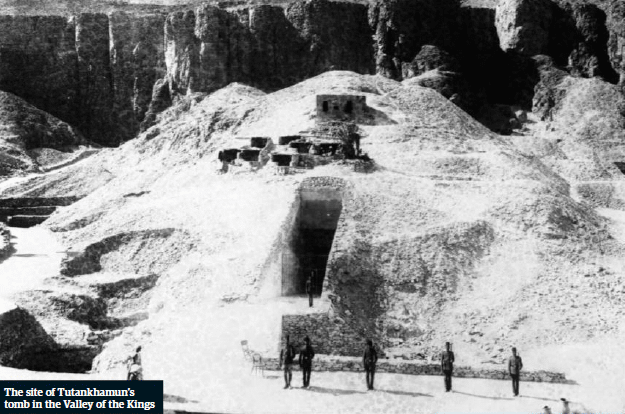 A private sponsor of Antiquities service, Theodore M Davies, after a thorough search, found a small site that bears the name of the boy king, Tutankhamun. Davis, therefore, feels he had discovered the boy king’s tomb. In his work as regards his research, he says, “I fear the Valley of the Kings is now exhausted”. However, Howard Carter so much believed that the tomb existed despite several critics claim that it might not have been in existence. Howard Carter at this time had left the Antiquities service, where he worked, for good. He, therefore, lived on the sales of his painting to people of the great affluent. So, he couldn’t afford the funds to object Davis’ discovery of the tomb not being in existence. 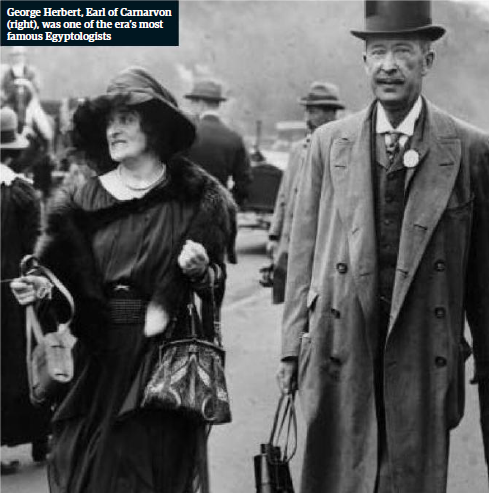 However, the different discoveries in Egypt at this time endear also the 5th Earl of Carnarvon, George Herbert. This brought Howard Carter luck as the men became a team and were eager to make a worthwhile discovery. More so, they needed each other’s resources and skills for the discovery. In 1909, they became a team and started their discovery hunt in 1914 after Davies had given up on the research. Their contemporaries, however, saw them as inadequate and lacking in knowledge and therefore, advised them to desist from the adventure because it might lead to the end of Carnarvon’s wealth. 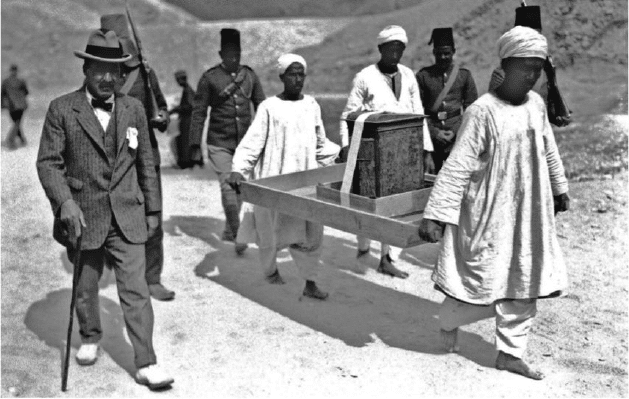 Refusing to be discouraged, they set out to search for the tomb which Howard Carter believed existed. Their work was interrupted by the World War I, so, Howard started his research in 1917. He started from the very top of the Valley of the Kings to its bottom. 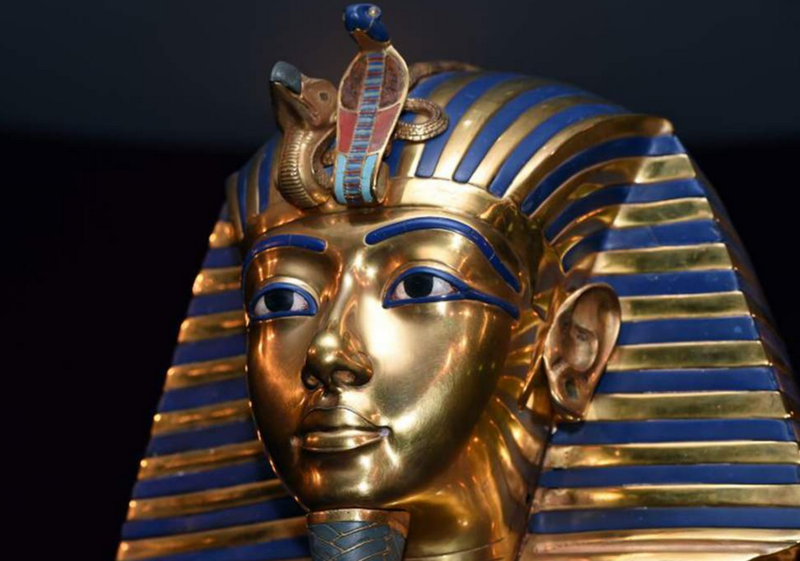 After several diggings which were exhausting, they could not find a thing like king Tut’s burial. Carnarvon began to doubt the existence of King Tutankhamun’s tomb and begins to fear that he might actually lose his wealth in a fruitless research. Even though he was initially elated about what he would gain from Egypt and the promises of Howard Carter, he watched his money go into a bottomless pit with no reward and he started losing his patient. Howard Carter succeeded in persuading his friend to put in resource for a final season, after six failed seasons. Carnarvon granted him a last one and told him if he could not find anything, it would bring the end to the money and their search of the boy king Tutankhamun’s tomb and Carter agreed. He put in more effort and searched other places he had not touch, especially the area beneath the entrance to Ramesses VI’s tomb. This site was left untouched because unearthing it would be a disturbance to the millions of tourists who are anxious to see the tomb. November 1, 1922, Howard Carter and his crew started clearing away the rubble and three days after this, they hit the jackpot, they found a step that was carved into the rock. They followed the step-down and realized a covered and plastered doorway with a seal on it. Howard Carter waited for Carnarvon’s arrival which seemed like a waiting for Godot. While waiting, he thought of what he had just discovered, he thought Carnarvon who was used to being disappointed and he concluded he probably had just found a dynasty cache. When the doorway was opened, it reveals the name of the boy king ‘Tutankhamun’. He felt it was either he or one of his team that has put up the seal in an accurate shape because it looked as though it has been tampered with by some ancient robbers. When Carnarvon arrived, with his daughter, Lady Evelyn, the air was tensed as they set to open the doorway and gain entrance into the tomb of king Tut. It seemed like forever for the debris that was in front of the doorway to be removed. Carnarvon was just walking to and fro in his anxious state. His daughter also fiddled with her hair, anxiously. Despite all of this, Howard Carter kept his cool and stood still, waiting and watching. As Carter moved forward with his chisel to try the door, he noticed his hands were shaking. When he used his chisel to remove the plaster on the doorway, there was an opening. He tried checking the inside with a long iron rod to be sure of what awaits them. He also tried to check if there were no obnoxious or dangerous gases in the Tutankhamun’s tomb. He tried to widen the hole a bit to be able to catch a glimpse of what laid beyond. All he saw was darkness, hot heat tried to escape through the tiny hole and he was able to get some pictures of what they about to face – strange shapes, some animals that he had never knew existed, statutes and gold, the gold was everywhere. In fact, it could be said that the place was made of gold. When Carnarvon asked if he could see anything, he answered, “yes, wonderful things”, these three words are what escaped from his mouth as he was dazed. When the doorway was successfully opened, just what Howard Carter exclaimed was what they saw- wonderful things. The little chamber that was revealed was full of different beautiful treasures, golden chests, chariots, bed made in different animal forms and several other beautiful things. However, Carter noticed he could not see any coffin in the chamber. He, however, noticed some other doorways sealed at the northern and western part of the chamber. Carnarvon and Howard could not resist the doorway at the northern part, they felt endeared to it. The doorway was guarded by two of the boy king guards’ statute. 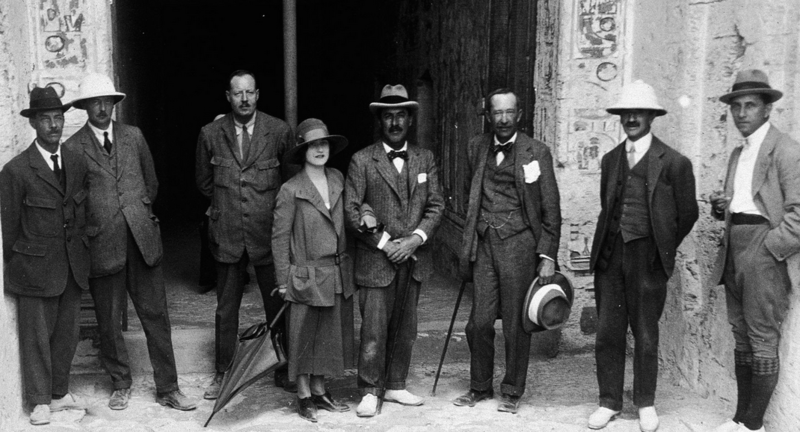 Lady Evelyn and the two men set to explore the burial chamber of the boy king, Tutankhamun. Even though the ancient robber who was there at some time tried to hide all evidence, their adventure was visible to everyone there. How they blocked the route through they left, a modern plaster was laid behind a basket lid. However, no one could really care about the breaking in of the thieves as the joy of discovery over flooded them. Towards late November, several pressmen had gathered at the discovery scene for a proper opening of the tomb. Some people already had Tutankhamun’s name printed on Christmas cards and the place flooded with men from different walks of life, to see what has been discovered. 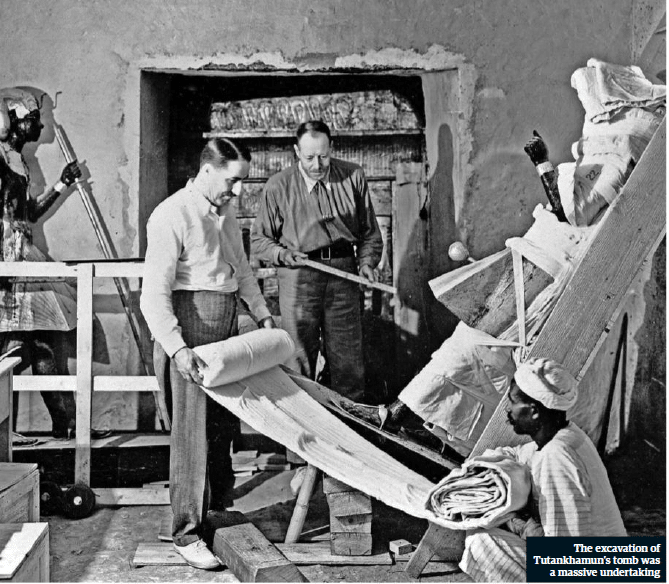 As eager as they all were to see what lays in the king Tut’s burial chamber, Howard Carter did not hesitate to document all that was discovered at different points in the tomb and he took his time to clear the place meticulously. It took Carter more than 2 months to complete the enormous work before him. It was great to work for him and his team. Every single golden chest that was found in the chamber went through mini evacuation because it seemed the gold and all treasures that were placed there was placed in a hurry and no time for proper arrangement. When it was eventually time for the grand opening of the king Tut’s burial chamber, Lord Carnarvon was anxious as he gave his speech. According to his brother, he was “like a naughty schoolboy”. Howard Carter opened the doorway and they were only able to squeeze through. What they saw was jaw-dropping. They saw a great shine of 2.7 meters high that almost occupied the burial chamber. It was completely endowed with gold and without doubt, contains the coffin of king Tut. 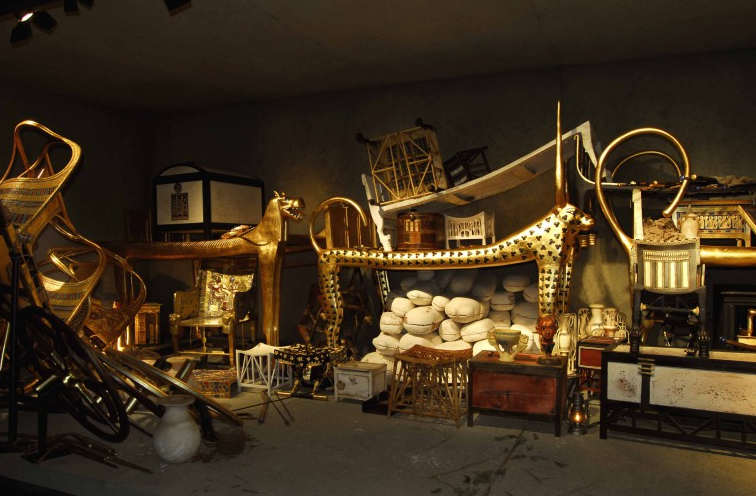 The burial chamber of Tutankhamun seem to be made with enormous treasures. Nothing of this sort has been discovered over the years, and mostly, will not be discovered again. The news of the treasures hidden in the tomb of king Tut, Tutankhamun seem to spread wider than fire. It spread across everywhere that even the British press was consumed by the great discovery. Nobles and royalty, the wealthy ones came also to have a look of the tomb that consists of beautiful treasures. Everyone wishes to have a personal viewing, a closer view of the tomb, however, only a few could enter, several others stood afar off to have a look. The following year, in April disaster, struck, Lord Carnarvon died. He was said to have been bitten by an infected mosquito, and he had cut the surface with a razor. The public and the press, however, had the belief that it was the dark mysteries of the Egypt king’s tomb that caused the death. They believed the tomb had been caused and those who had contact with it would bear the consequences. Many claimed that their penetration into the king’s solemn resting place had made the powerful and ancient king angry. Numerous stories of mysterious things kept flying around – Carnarvon’s death, Howard’s yellow canary being killed by a cobra and several other dark tales. There were also tales that there was an inscription on the king Tut’s tomb that read “Death comes on swift wings to him that toucheth the tomb of the pharaoh” and to the public, the inscription was coming to pass. The public, especially the press kept a close eye on those who involved in the evacuation process and the press does not hesitate to publish their mysterious death. 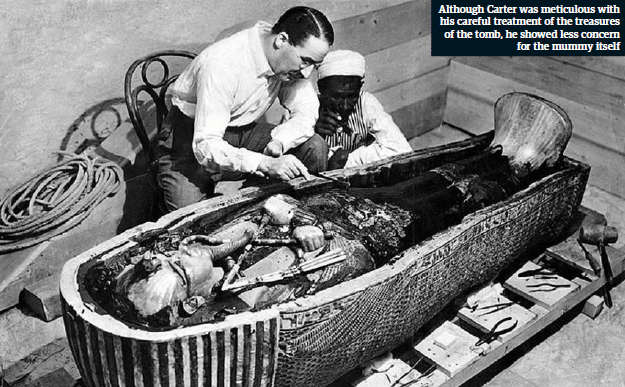 For Howard Carter, however, there was nothing like the curse of king Tut. He believed the place is as free as anything and could even be said to be free of risk than some other places. His treasures remained in Cairo museum until later in the sixties when it left its abode and was made to scatter abroad. At the British Museum, over 1.5 million people queued for more than eight hours to view the wonders of the boy king’s tomb. Not only was Howard Carter’s determination of great accord, he also brought the boy king, King Tut into the light and he is known as the symbol of Egyptology today.